With social media and the rise of social selling, you've got more of an opportunity than ever to learn about the business needs of potential prospects. As you may know, three-fourths of all B2B buyers use social media in their decision-making process. And what are they doing on social media? Consuming content. So it's time to take advantage of that opportunity. But just like you don't want to be the person walking around a happy hour handing out press releases before you say 'hello,' don't push digital content to someone out-of-nowhere. You'll want to gather context on how best to communicate with that person. There is only one way to do that: listen really well. Social listening is the most essential element of social selling, and in this post I break down four key ways to enhance your listening game. The essential first step is to understand a prospect's interests and concerns. Your buyers, social selling evangelist Jill Rowley writes, are doing just that. They're taking to "social spaces to talk about their interests, pain points, wants, and needs." Maybe your prospect is piqued by policy or big data. Or maybe (s)he is more into marketing. You'll want this big picture information. Get a sense for the person's Twitter feed and any thought leadership published to LinkedIn Pulse or sites like Medium. You can also set up a private list on Twitter to follow your whole roster of prospects as you gather information. Join the LinkedIn groups for the industry and follow industry blogs to see what the industry is concerned about at the moment. You'll also want to follow the company's page on LinkedIn for any updates that are posted. You'll want to start keeping track of trigger events that can mean the company is looking to buy. There are plenty of ways to set up these alerts. One way is to pay attention to whether a company is hiring. Under the Jobs tab on the LinkedIn homepage, use Advanced Search to find any jobs posted by your target company. You can save the search (on the top right of the page) and choose to have alerts sent to you daily or weekly. In setting up alerts, you could also target a particular phrase, like Rowley did. She explains how she had a Twitter alert set up for key terms related to her business. Once she saw a question arise on "marketing automation," she responded with a useful link to her company's page. All this listening is for naught if you don't have relevant and interesting content ready to share. So create a docket of content in different topic areas. When your prospect posts an update asking, for instance, how best to use search engine optimization for new websites, you'll have a smart blog post you either wrote or respect you can share. At least some of this ready-to-go content could be blog posts on your company's page, which is great way to softly pitch your services. The reason you have content ready is so you can pounce on a topic while it's fresh in your prospect's mind, and take advantage of the news that is concerning (or exciting) that person. “Arriving late to the conversation means you’ve missed your opportunity,” LinkedIn's own Mike Weir has said. "The right social listening tools make sure you can hear what’s happening in real time and deliver content that drives the conversation forward," he added. You'll be able to do just that if you utilize the tools and habits we've listed in this post. Once you've spent a bit of time listening, and set up specific ways and consistent methods to interact, you'll be more prepared with better and timelier pitches to capitalize on leads. 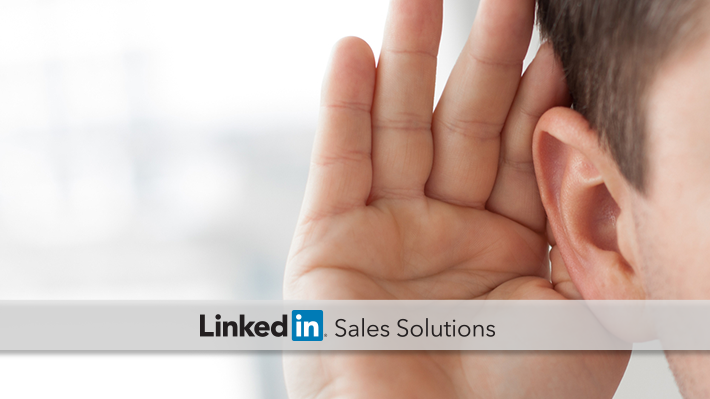 For more tips to up your social selling game, subscribe to LinkedIn's Sales Solutions Blog.